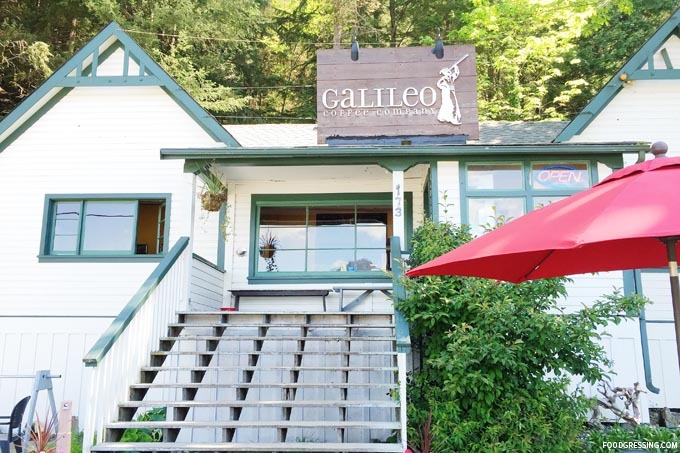 On our day trip to the Sea to Sky gondola, I made it a point for us to stop at Galileo Coffee. Having passed by them so many times on the way to Squamish or Whistler, I was curious about what they served. 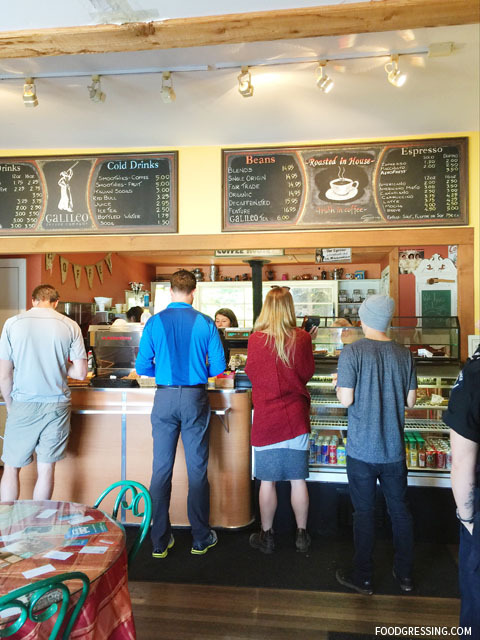 Located on Highway 99 in Britannia Beach, Galileo Coffee is perfectly positioned as a pitstop for road trip goers and long distance cyclists. The building of the coffee shop is very dated and word has it that is haunted (oh, my!). The coffee shop is isolated with no other stores or restaurants beside it. Their is ample parking right in front of the shop. We came in on a Saturday and the coffee shop was very busy. Most of the customers were doing takeout, but if you are looking to dine in, there are lots of seating options. Inside there are several dining tables of various sizes. You might want to enjoy your coffee outside: there is nice bench on their porch as well as a few patio tables on the ground level. 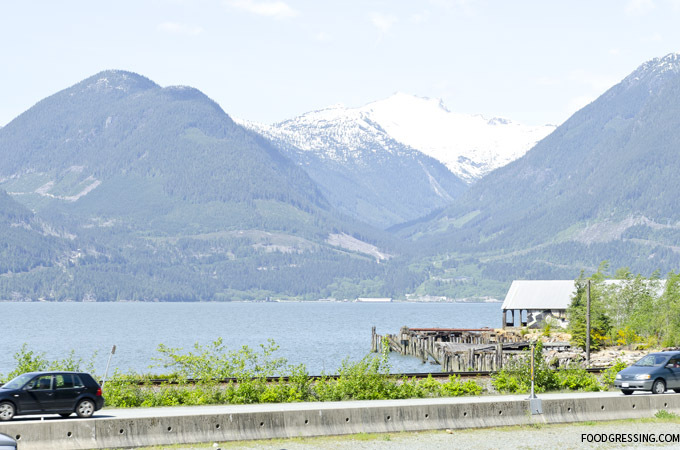 I would recommend sitting on their porch so that you can enjoy the view of Howe Sound (see the photo below!). I also appreciated how dog friendly the coffee shop is by having a place where you can leash up you dog. A bowl of water for the dogs is also placed near the leash-up area. Galileo Coffee roasts their own coffee. Aside from serving espresso drinks, they also sell their own brand of coffee beans, tea, and other coffee merchandise. Food choices are limited and include a small selection of sandwiches/wraps and baked goods choices like dessert bars and brownies. We tried their feature latte which was a coconut and lavender latte ($3.75) as well as a cranberry oat bar ($3.25). 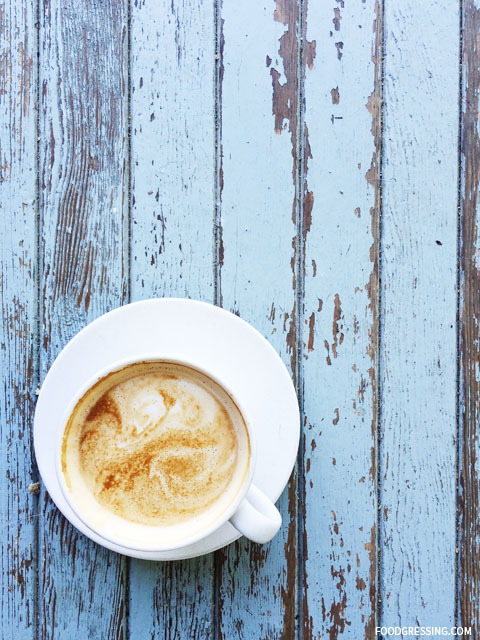 The latte was very fragrant and smooth but I found the flavour from the coconut and lavender syrup to be too strong. The drink became too complicated in flavours in my opinion. The cranberry oat bar was too sweet I thought but it crumbled nicely.